Are you looking for a basic office chair for gaming? Maybe you need a chair that works for both the home office and casual PC gaming? Finding the right chair can be tough, especially when you don’t want a lot of extras. If you want a chair that can double as an office chair instead of a dedicated gaming chair, it may be hard to narrow down your choices. And you may be looking at the SPACE Seating 5700E Professional office chair to fulfill all your needs. If you want to know if this chair is the best one for you, keep reading. Find out the positive and negative features so you can make an informed decision. The SPACE Seating 5700E is part of the 5700-series manufactured by Office Star Products. The company is known for its value offering of commercial and residential furniture since 1987. In addition, this particular series is GreenGuard Certified. That means that it promotes good air quality indoors because of the chair’s low chemical emissions. This chair is a great solution to gamers looking for a chair for casual gaming, or those on a budget. It has minimal back support, however, so it may not be the best solution for anyone with existing back problems or for people who plan to spend all day in the chair. All the necessary components for the chair are included in the box. This includes the chair pieces, screws, washers, and Allen wrench. You also receive instructions, complete with diagrams, in the box. This chair is relatively basic for an office chair. But sometimes that’s all you need. 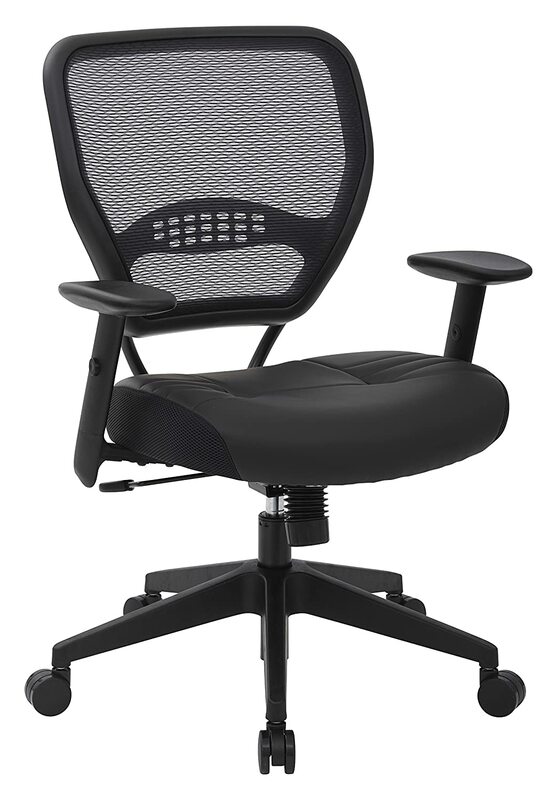 The 5700E Managers Chair features a mesh back for breathability. It also has an eco-leather seat with breathable mesh sides on the cushion. According to the company, the “eco leather” seat is made from 20% recycled leather, as well as 20% fabric and 60% polyurethane for the sides and cushion. The chair has a minimum seat height of 19 inches, which may be a bit high for short people to sit comfortably. However, if you fall into this category you can always use a foot rest to set your feet on top. On the other hand, the maximum seat height is relatively high at 25 inches. The seat can lock in an upright position or tilt with pressure. You can adjust the chair’s maximum tilt, but there is no lock to keep it in place. This chair also doesn’t have a headrest, but if you don’t plan on reclining often or sit for long periods this may not be a big deal. It does have built-in lumbar support, though it is not adjustable. And if you already have back problems, you may need to add a separate cushion to provide further support. For your added comfort, this chair also features angled adjustable armrests. However, if you’re looking for an office chair without armrests, you can leave them off entirely during assembly. Furthermore, the 5700E also has 360 swivel capabilities supported on a durable angled nylon base. It also goes smoothly over most flat surfaces because of its oversized dual wheel casters. If you want a chair from the same manufacturer, but need more support you can try the 5706E Professional AirGrid Executives Chair. This chair delivers the same quality you expect from a SPACE Seating chair with a few upgrades. Along with a breathable mesh back and eco leather, this model also has an adjustable headrest as well as adjustable lumbar support. The minimum seat height is approximately ½ an inch lower, too. These upgrades also come with a higher price tag; however, it may be worth it for the extra support. Especially if you game for extended hours at a time. Another alternative you may want to consider is the Hbada Ergonomic Office Chair. The Hbada features a high mesh fabric back with a curved design to minimize back pain. Furthermore, the chair also has a tilt lock mechanism that reclines up to 160 degrees and adjustable lumbar support. If you are looking for a mid-price chair with a lot of support, this one may also be a good solution. Is the SPACE Seating 5700E the right gaming chair for you? It is if you want a budget chair with basic comforts such as breathable fabric, adjustable height and armrests, and an optional tilt mechanism. However, if you are looking for a chair with optimal back support, this may not be the one for you. If that sounds like you, you may want to consider the upgraded 5706E model from SPACE Seating. Or the Hbada Ergonomic Office Chair. Both options are a little pricier than the 5700E, but they offer additional head and lumbar support that you may find worth the extra cost. Finally, the right chair depends on how long and how often you plan on gaming. If you keep your sessions relatively short or get up for regular breaks, the SPACE Seating 5700E may be all you need.